Major Lee Weeks vibe off this richly detailed piece by Gabriel Hardman, who I believe is drawing The Incredible Hulk these days. Frog steeds are so full of win! Taken from Charlton Bullseye #2, which also featured a new CA story by Stern, Ditko & Byrne. The Groovy Agent has a whole set of pin-ups from the prozine at Diversions of the Groovy Kind. 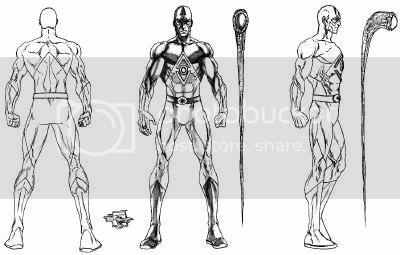 Closing out our lengthy look at the Blackest Night designs of Joe Prado on a positive note, here's an unused version of Ray Palmer as an Indigo Tribeman... Luddite... Torchbearer.... whatever. I thought it was kind of strange that most of the Skittle Corpsmen wore color-altered variations of their standard gear, while Ray went full native. Now I understand, since the alternative was to look like a Mathlete Jesus Freak escapee from a free edu-spiritual comic. "Christ is Greater Than 'Fun' Eternal Damnation from the Harry Potter or Grand Theft Autos." I guess that walking stick could double as a super-scientific colonoscope into the constipated bowels of the infernal. Or help students see past their confusion over ratio proportion. "Be like the Formulaic Titan, and use dimensional analysis!" 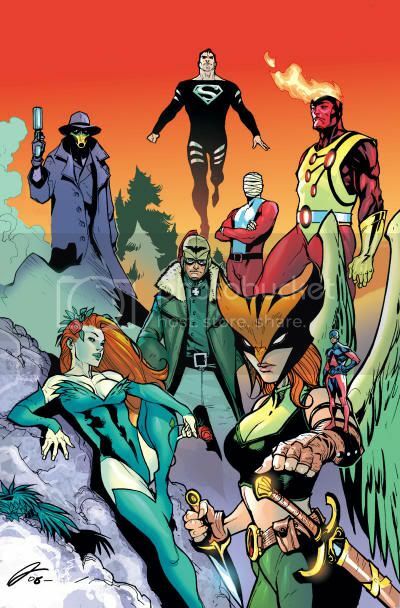 The Atom (Ryan Choi) rides on Hawkwoman (Shayera Hol) amongst a disparate team including Poison Ivy, Enemy Ace, Sandman (Sandy Hawkins,) Negative Man, Firestorm (Jason Rusch) and what I assume is the silver & black costume variation on Superman. This has also been referred to as "Alternate League." If the story existed before the character selection, this might really be worth reading. If it's just a random collective the artist felt like drawing, no such story should ever be commissioned. I suspect it would be a shambling wreck. The artist doesn't know what "LJA" stands for, so don't keep yourself up nights wondering. 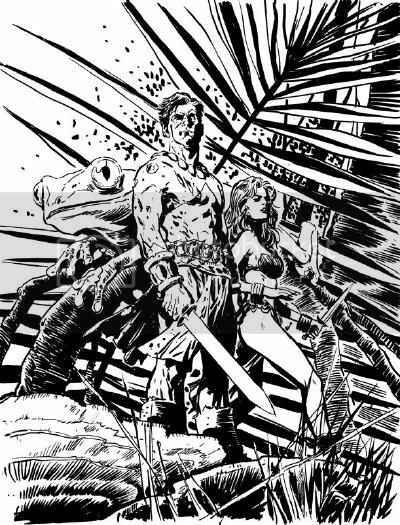 Inspired by the best-selling SOE game, the epic series continues as we see the last stand of the future JLA in issue #7! Batman’s survived horrific injuries and outlived all his allies to try to implement a final, desperate gambit...but is Luthor trustworthy? And in issue #8, after an epic disaster is inflicted on Metropolis, Superman works to pick up the pieces – literally. But can he overcome his concern over Lois’s disappearance? And as Brainiac and Luthor regroup, their plans start to coalesce in a surprising direction as the war for the future begins! This month looks to be a good time to mention that I'm not sure there will be an Atomic acCounting next month. Lemire's Atom back-up/specials are at an end, as has JLA/The 99, and Brightest Day has come to a close. Captain Atom's monthly showcase in Justice League: Generation Lost has also gone missing. Unless the Atom continues to be relevant through DC Universe Online Legends, I don't have much to work with. Artist Brian Bolland, best known for his work as illustrator of the best-selling title BATMAN: THE KILLING JOKE, is the subject of this new hardcover collecting his covers for DC Comics. Featuring highly detailed and meticulous craftsmanship combined with dramatic takes on the world’s best-known Super Heroes, Bolland’s work has been featured on GREEN LANTERN, BATMAN, WONDER WOMAN, THE FLASH, ZATANNA and the Vertigo series THE INVISIBLES and ANIMAL MAN. This spectacular collection includes rarely seen and never-before-published art, along with commentary from Bolland. Following the deaths of Batman and Martian Manhunter – both charter members of the Justice League of America – a new team of heroes arises, determined to stop evil from ever striking. But when the JLA’s foe Prometheus plans his revenge on the heroes, will this new team be ready to pay the cost for the justice they seek? Collected from the 7-issue miniseries! The best-selling 12-issue series illustrated by Alex Ross is now available as a single volume hardcover at DC’s standard trim size. The villains of the Legion of Doom — led by Lex Luthor and Brainiac — band together to save the world after a shared dream that seems to be a vision of the Earth’s demise. They are confronted by the Justice League of America, who doubt their motives—and as their true plans unfold the two teams do battle. I promise to finish my synopsizes of this, just as soon as I can be bothered to finish reading the damned dumb thing. History has gone awry, and only one member of the JSA All-Stars can put it right: The Prince! Who’s that, you say? He’s not a member of the JSA All-Stars? That’s what they thought, too! He claims his father’s archnemesis has altered the past to prevent him from ever being born . . . but how can he prove it to the All-Stars? And what is his ultimate goal? What about Nuklon, you ask? Canceled this month. I can finally stop worrying about constantly forgetting to mention this title. Whose bright idea was it to launch a JSA spin-off just after its guiding force of the last decade finally retired from the flagship anyway? In these stories from issues #13-18 of her series, Power Girl finds herself mysteriously unaware of the period in her life when Max Lord was pulling her strings as part of Justice League International. Meanwhile, the distractions of being a heroine cause her business to falter as her friends and co-workers disappear. Shag at Firestorm Fan shot me an email the other day alerting all Ryan Choi fans to this latest use of his Batman: The Brave and the Bold Atom icon shield! This The Atom shirt features a shield logo for the DC Comics superhero. The Atom is actually a codename shared by 4 different members of the DC Universe. I believe at this point I own a complete set of Breach, and I think I managed this feat for less than ten bucks, with change enough for a hamburger (and not just a Jumbo Jack.) I haven't read a single issue yet, but I've heard nothing but good things about the book, and I've tended to enjoy Bob Harras' writing more often than not. 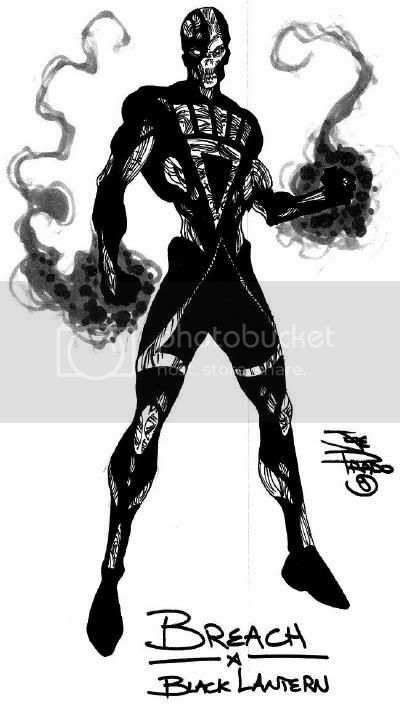 Breach was conceived as a relaunch of Captain Atom, until the company decided to go a different way and have Harras convert his ideas to serve a brand new character. 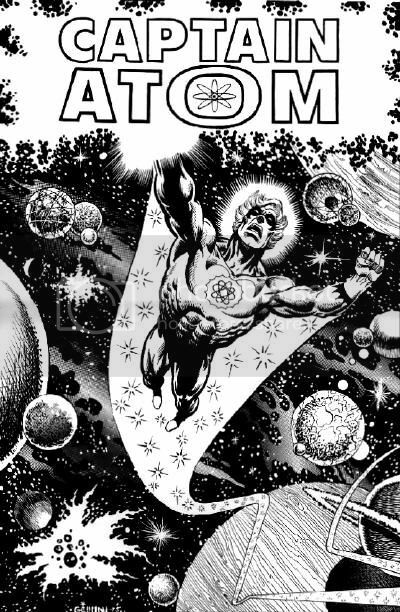 I liked the Post-Crisis Captain Atom, but that version of the hero had been both flagrantly unfaithful to the Ditko original and seriously mangled by Armageddon 2001. If through some quantum field tap dancing Nathanial Adam became Breach, and Allan Adam came back from '60s Charlton as the all-classic Captain Atom, I think DC would be a better place (especially if no one ever mentioned Monarch again.) 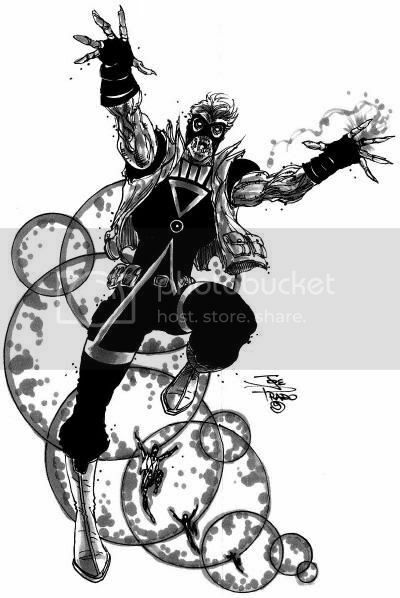 Instead, Breach was tossed into the pool of post-Zero Hour derivative/revamped trademarks that Geoff Johns assigned to "Earth-8" as duplicates of (often only slightly) more famous Earth-1 heroes. Breach could have been to Captain Atom as Power Girl is to Supergirl, but instead he was killed during Infinite Crisis. I had to wiki that fact, because Captain Atom gets breached all the time, but I guess a Breach breach meant the dude actually died. Good or not, I'm pretty sure Breach would have to have been better than Infinite Crisis, which was no Millennium, right? UPDATE: I have been informed Breach was actually killed in Countdown: Arena. Holy f'n shnikies that's lame. I read fewer and fewer DC Comics and feel better and better about that fact. This was supposed to have posted last week, but I didn't realize the auto-publish never kicked in. Bygones. It still ticks me off to think of the stupid, pointless waste of killing Grant Emerson. There were a ton of fun concepts no one ever played with after the Damage series ended, not the least of which being his accidental leveling of the city of Atlanta, GA. 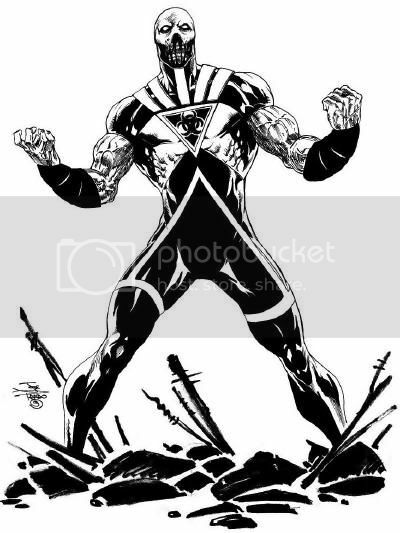 The genetically engineered "son" of a fair chunk of the All-Star Squadron, the kid was powerful enough to ignite the Big Bang at the end of Zero Hour, and he owed his existence to Vandal Savage. In a universe with a lot of meh villains, Damage could have made a fantastic heel turn. Instead, he was a cheap death in an overrated event at a time when he was treated as a second-rate Nuklon... a character lacking the popularity to have much impact in passing, and at a time when everyone expected a reset button to undo all the killing anyway. Damage went through a number of costumes, and every single one of them was seriously happening, thanks to their incorporating nuclear and bio-hazard iconography. I believe this is also the best of all the designs Joe Prado is selling. I don't know the price because it's listed with a "PI," but I know the character himself was sorely undervalued. Thanks to Bleeding Cool for promoting this piece in a gallery.